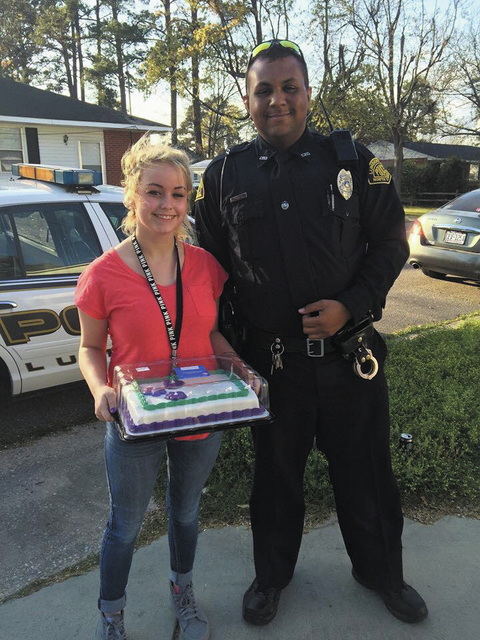 LUMBERTON — Officer Daniel Dimery of the Lumberton Police Department knows how important birthdays are to teens. That’s why he wanted to lift Drew Drake’s spirits after a burglar swiped the 17-year-old’s birthday cake on Thursday. “At that age, birthdays are supposed to be milestones in your life,” Dimery said. Drew’s mother, April Drake, called the department to report that someone had broken into her home on East 13th Street during “daylight hours” after throwing a rock through a window, according to the incident report. “They went through the whole house and pretty much destroyed everything, but they only took the daughter’s items,” Dimery said. The stolen items included $200 worth of clothes, an $80 purse and the $20 birthday cake. Some of Drew’s drawings were also taken. No electronics, guns or other valuables were stolen, according to the incident report. April said that several items had been stolen from her yard in recent months, and the family was in the process of moving away from the city before the break-in happened. “I didn’t want that to be her last memory of Lumberton,” Dimery said. After he filed his report, Dimery returned to the home with a new birthday cake for Drew. 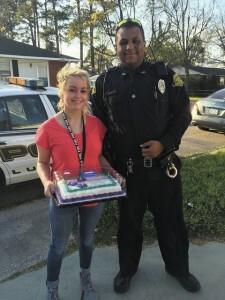 “He saw that I was really upset and he went out of his way to try to make my birthday a good day,” said Drew, who is a student at Lumberton High School. April said that Dimery’s kindness helped turn her daughter’s birthday around. Burnis Wilkins, a Lumberton city councilman, praised the officer in a Facebook post that had been shared about 300 times as of 4 p.m. Friday. “[It was] an awesome gesture and a positive for police officers as they continue to be bashed across this country,” Wilkins wrote. The way Dimery sees it, he was just doing his job.